Patient-centered medical homes (PCMHs) and accountable care organizations (ACOs) were often considered to be competing models for reforming health care delivery. Not now. It’s increasingly apparent that one helps the other. 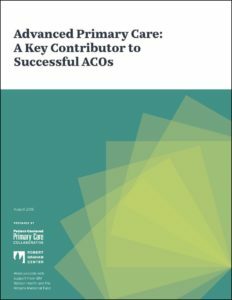 That’s the main finding from the new Patient-Centered Primary Care Collaborative (PCPCC) 2018 evidence report, “Advanced Primary Care: A Key Contributor to Successful ACOs,” the first study of its kind to look at how the role of advanced primary care, such as the PCMH, may contribute to the success or failure of ACOs. The report was published with support from the Milbank Memorial Fund for the fifth time. While further research is needed, the report findings suggest that a strong foundation of primary care as embodied in the PCMH is critical to the success of care delivery reform. With 10% of the US population in ACOs and growing, and more than 20% of primary care physicians practicing in PCMHs, the findings have widespread applicability for public and private policymakers who should consider evolving both these programs to increase their effectiveness and improve our health care system.